Filippo D’Ascanio first appears in the Painesville, Ohio, area in 1918. In America, Filippo D’Ascanio was known as Philip D’Ascanio. Filippo D’Ascanio was born on October 12, 1883, at Roccacasale, Italy. He married Michelina Ostoma, daughter Felicia Santangelo, in 1907. Filippo died on July 9, 1968, at Lake County Memorial Hospital, Painesville, Lake County, Ohio. His body was interred at St. Mary Cemetery at Painesville Township, Lake County, Ohio. Filippo D’Ascanio, age 25, immigrated to the United States on February 16, 1909, travelling to Kentucky. 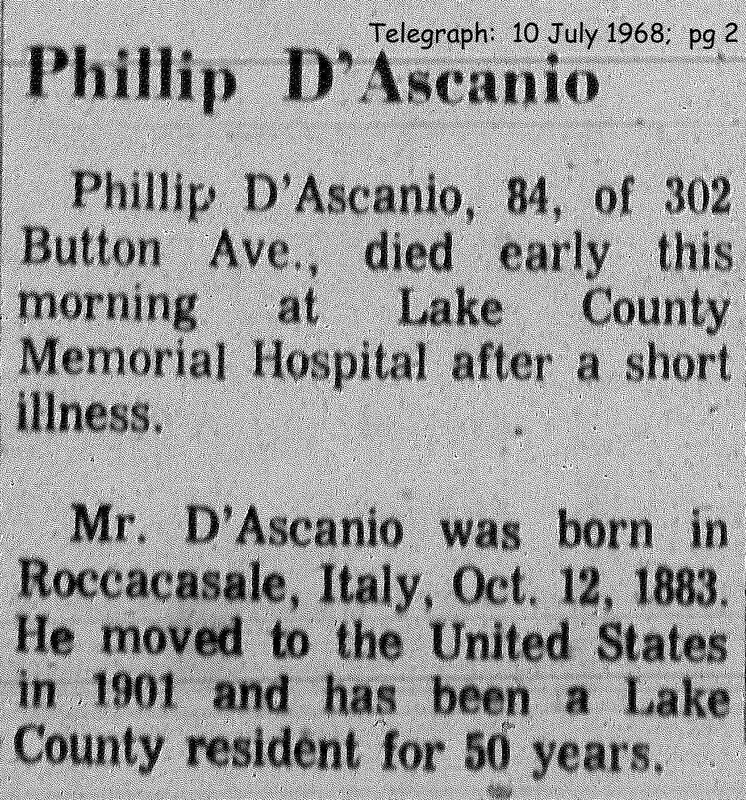 The D’Ascanio family moved to Painesville, Ohio, about 1918. Filippo D’Ascanio became a citizen of the United States on June 20, 1927. Filippo resided at 518 Seventh Street, Fairport Harbor, Lake County, Ohio, when he was naturalized. 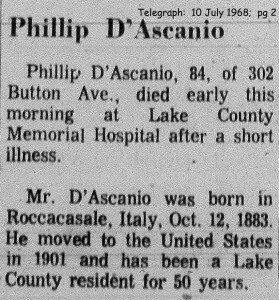 Mr. D’Ascanio retired from the Diamond Alkali Company in 1953. 1. James V. D’Ascanio was born on April 6, 1915, at Kentucky. James died on February 20, 1979, at age 63. His body was interred at St. Mary Cemetery at Painesville Township, Lake County, Ohio. 2. Ovidio J. D’Ascanio was born on June 30, 1917, at Kentucky. Ovidio died on October 6, 1942, at age 25. His body was interred at St. Mary Cemetery at Painesville Township, Lake County, Ohio. 3. Antionette D’Ascanio was born about 1922, at Ohio. She married Angelo Castello.